You need to add the [\img] at the end of the last two pictures and then they will embed in your post. I love the pictures and your creativity. It gives all of us ideas of how to make our own combinations. How do you get the 2 two small rubber bodies to stick together? Would a heat gun work? Does hot glue stick to these rubber bodies? Adding [\img] didn't work for the last two. There is a soft plastics glue I've used with some success on most plastics, but a candle flame never fails. Hold the parts briefly over the flame and hold them together for a few seconds. To ensure a smooth seam, I use a battery powered soldering gun to smooth the surface plastic. sorry, I think the img part has to be in all caps. Now the top pictures disappeared too. Sorry if I messed you up. Probably a moderator could help fix it. Sam, I don't know what you have got going on, but your obviously catching fish with your Franken-lures. 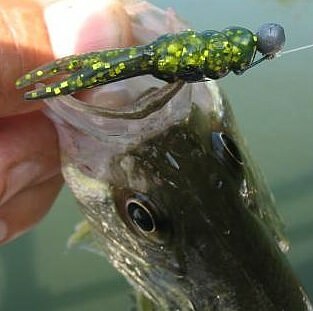 I am having difficulty understanding the neon green lure and how it is rigged to the jig head. I hate to stress you with another photo request as all forums seem to have their nuances when it come to posting pics, but an explanation of how the green grubs fused at the ends is hooked by the jig hook would be interesting. I believe he's got it rigged wacky style thru the middle of the grub. Equal lengths floating on each side of the hook shank. Never heard of "wacky style". I had to look it up on utube...looks promising. Thx Mike. Killer rig with a Senko! 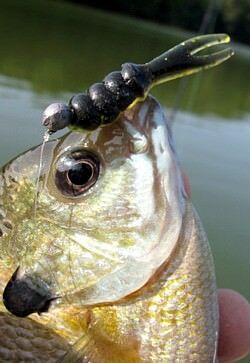 I use a rubber O ring pushed down over it to where I want the hook to be and slip the hook between the lure and O ring, instead of thru the lure so the bait lasts a lot longer. The senko is loaded with salt and is heavy enough to cast w/o weight and it sinks slowly. Fish it like you would a jerk bait. If you have a lot of grass, use a weedless hook to twitch it thru the cover....and hang on!! Mike is correct. Many anglers assume that sticks similar to 5" thick-in-the-middle Senkos are the only lures used that way as well as the use of a bare hook. After making the 2" stick below I knew the plastic's light weight would take forever to drop wacky style, therefore the 1/32 oz jig was added. The whole concept of wacky rigging worms or sticks is making the ends and body wobble on a moderately fast vertical drop. But when a rod tip is twitched, the whole lure twitches like a creature in spasm. Fish take notice and strike. I fish thin short worms the same way: jig hooked in the middle, twitched or allowed to freefall to the bottom. Tails removed and ends held over a candle flame. I hate to see lures collect dust after years of sitting in a closet, so a few years ago I decided to modify soft plastics lures. Since Most curl tail grubs don't work for me as often as other soft plastics and finesse action lures I've designed, I search for others that work most of the time and on all freshwater fish species. One lure is capable of catching all sizes of catfish, panfish, bass, pickerel, gold shiners and carp - the more the merrier! The question was asked about the unnatural green color. Fish aren't bright enough to care as long as the lure moves the right way and is within a certain size range. When it comes to the lures shown, I usually use light jigs to hook the lures the usual way: from the front. 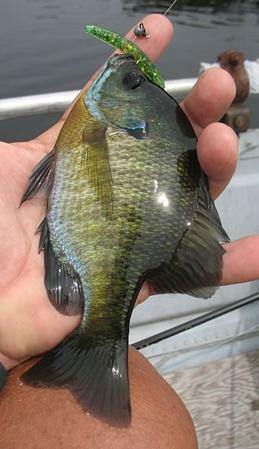 The action is different depending on that added with rod & reel and catches inactive fish as well as active fish. That did it! Thanks so much. I have other examples to post once my photo site goes back up. strange that about 1 out of 4 of your pictures embed in the link and the others do not. Anyone know why? It appears to be caused by the question mark & number at the end of the url. All the ones that display do not have that. One more for you to fix in your first post SAM, top post in this thread, the first picture is not fixed yet. Thanks Tom for your help! Strange why the photo storage site would include the ? mark and number. Copy & paste url transfers work on other fishing forums but not on two. In any case, problem solved/ I fixed the others. The jig and wacky 2" stick was cast in my pond in early spring just to see the action. No fish caught, but when I saw the action on the drop, I knew it was going to be a winner! First time fished I fished it in a lake in 8' of water, it caught over 2 dozen fish until a pickerel bit it off. Here's another design example that is universal for all lakes and fish species: the cone tail grub. After confirming the success of the design, I produced another but used a soft plastic for the tail that gave it extra quiver. Over a year ago, I found another lure in my box - no idea how it got there - and fished it on a light jig. Fish after fish hit it! 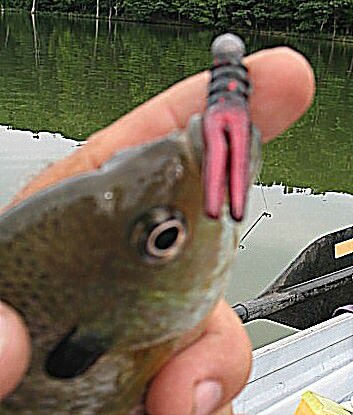 Turned out after some research that it was a Crappie Magnet grub that had the same tail design except it was split. Now you may think, doesn't the split add more action? Not enough to matter. Both tail designs quiver and both lures dart with rod tip twitches. Not much action to speak of, but if it catches fish, so what! Never saw it until just now. 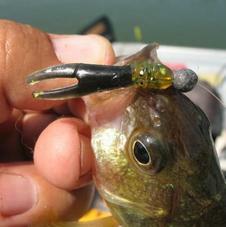 Senkosam, The Reaction Lure Company that I spoke of was in Many Louisiana on Toledo Bend Reservoir. Guess they may be totally out of business now. I still have cases of some of their old soft plastics!! Reaction Innovation seems like it is a totally different organization. Though I would think by them using that name that my old company must be out of business. But I must say the Pocket Rocket does look interesting!! Had a feeling it was a different company. Good memories to share, Flame. Oddly, I've never had much luck on wacky style worms, probably because I have zero confidence in them & give up after 5 fishless minutes! Thanks! I'm looking to target CNBG and smaller LMB and this looks like a great idea. But I've found that fish DO care about lure color at times, for reasons I frankly don't understand. One thing I have experienced: gold colored jigworms get far less LMB action than any other color I've tried, regardless of season or BOW. Ant...One day on Rayburn with me at the right time and I could make a believer out of ya on the wacky worm! !